We'll change the way you feel about dealerships, forever! In recent years, the Subaru Forester has graduated from being a scrappy, utilitarian little tall-roof wagon to something just a little more comfortable and full-featured. Fortunately, all that’s made this one of the best familyvehicles has stayed intact. 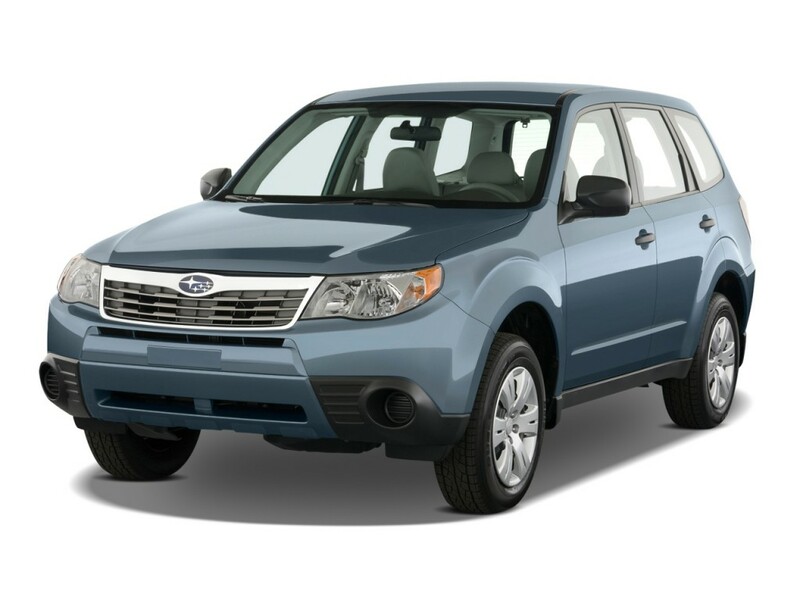 With all-wheel-drive security, a versatile, roomy interior, and a more manageable size compared to other crossover vehicles, the 2011 SubaruForester is nearly the perfect vehicle for smaller families and understated, outdoorsy parents—especially those who want a compact vehicle that’s also easy to maneuver and park. On the FamilyCarGuide scale, it’s a 9 out of 10; the only things that kept it from being a perfect 10 were its some not-quite-perfect safety scores, and interior materials that can feel a little bargain-basement. There’s a lot to like about the Forester’s package in general. Front seats are high and upright, affording a good view out, and there’s a good view around without the need for an array of fancy cameras and sensors. New parents like it as the backseats are also a bit taller than most passenger cars, which makes it a little easier to lean over and belting little ones into place. The Forester’s forte remains its ability to trudge through deep snow, or even mud (or get to that remote campsite) without complaint—thanks to 8.7 inches of ground clearance—yet handle on curvy roads with the balance and poise of a compact sedan. For 2011, the base Forester gets a new engine that isn’t really any stronger than the former one but gets slightly better gas mileage. You’ll still see city mileage in the low 20s and around 30 on the highway. Forester XT models get a turbocharged engine that makes 224 horsepower and makes the somewhat frumpy Forester a ‘sleeper’ sportwagon. The Forester is a longtime high achiever in insurance-funded IIHS crash tests, but it hasn’t done well in the latest federal tests; it only scored three stars for side impact. Subaru has increased features and equipment in the Forester, with an integrated Bluetooth hands-free interface, Bluetooth audio streaming, iPod controls, and satellite radio now included in all but the base model. With six months of sales results in the book, and the effects of a parts shortage in Japan behind them, the second half of 2011 will bring increased production and additional hiring to Subaru of Indiana Automotive Inc. in Lafayette. A March 11 earthquake and tsunami in Japan disrupted parts production and exporting from that country. It also impacted sales results for some vehicles, including Subaru models and the Toyota Camry which are built at SIA. With the parts problem solved, SIA is planning to ramp up production soon by returning to daily and Saturday overtime hours for some associates at the Lafayette plant where the workforce numbers approximately 3,550. A report released Friday by Subaru of America Inc. shows the company sold 19,794 vehicles last month. That’s 8 percent fewer than were sold June of last year. • Sales of the Legacy increased by 15 percent, to 3,471 units. • Sales of the Outback rose by 21 percent, to 7,914 units. • Sales of the Tribeca gained 3 percent, to 180 units. Among the company’s Japanese-made models, sales of the Forester fell by 28 percent, to 5,466 units; while sales of the Impreza line dropped by 35 percent, to 2,763 units. Through the first six month of 2011, Subaru sales totaled 132,049 — an increase of 5 percent over the January-June period of last year. Six-month sales figures for vehicles built at SIA show customer acceptance of the Outback grew by 25 percent, to 51,239 units, while the Legacy posted a 12 percent increase, to 21,284 units; and the Tribeca lost 3 percent, to 1,274. “We still have record demand for our product in dealerships, however we are still working through a low inventory period after the March earthquake and tsunami in Japan,” said Thomas Doll, executive vice president and chief operating officer at Subaru of America. Synthetic oil is recommended for optimum engine performance and protection. Conventional oil may be used if synthetic oil is unavailable. Conventional oil may be used if replenishment is needed, but it should be changed to synthetic oil at the next oil change. Note- your owners manual might not indicate this depending on the printing date. This change was made around March 2011. Now all 2011 Subarus should use Subaru synthetic oil since the 2011 Forester 2.5Ls and all turbos ( WRX, STI, Forester XT, Legacy GT) have required it since the start of the model run. All 2011 models use Subaru 5w-30 except the Forester Xs which uses Subaru 0w-20. Subaru’s EyeSight, Subaru’s third generation safety system will be launched in Australia later this year. Australia is the first overseas market for this advanced technology. EyeSight has already enjoyed major sales success in Japan. EyeSight is a driver assistance system that combines active, passive and preventive safety technologies. It uses small stereo cameras located in a single compact unit near the rear-view mirror to recognise any potential road hazards and alert the driver. EyeSight is a testament to Subaru’s long-term safety commitment, in addition to its independent five-star ratings for occupant safety across all its models. This rating has been awarded by the Australasian New Car Assessment Program (ANCAR). 1. Pre-crash braking – the brakes are applied when a vehicle ahead in detected slowing or suddenly stopping and the driver had failed to apply the brakes. 2. Pre-crash brake assist – the system can generate 1G maximum deceleration top help reduce impact or damage when it senses that a collision is highly likely to occur. 3. Progressive start control – in the event that a driver accidentally applies full throttle close to a large object in front of the car, EyeSight will inhibit the throttle opening, minimising or potentially avoiding impact. 4. Adaptive cruise control – the system is able to maintain a safe distance from vehicles in front. 5. Lane departure warning – EyeSight alerts the driver if the car is drifting across from its lane. 6. Vehicle sway warning – the system alerts the driver if the car is beginning to sway from one side of the road to another. 7. Progressive motion monitor – when the vehicle in front starts to move, EyeSight alerts the driver with an audible reminder and information display indicator that the vehicle ahead has moved. With its advanced technology in safety and impact prevention, EyeSight is indeed a feature that future Subaru owners can look forward to. According to Nick Senior, Managing Director of Subaru Australia,“We will introduce EyeSight as a standard feature in Some Liberty and Outback models later this year. EyeSight is designed to protect drivers from frontal collisions, lane drifting and low speed impact. It can also recognise pedestrians, motorcycles and cyclists within its field of vision. Starting with the 2011 model year, Subaru quietly introduced its third-generation flat-four, called theFB25, in the Forester 2.5X. (The turbocharged four in the 2.5XT is still the old EJ25.) The FB25 makes the same 170 hp as the EJ, but torque is up 4 lb-ft to 174. A gain of 4 lb-ft isn’t the only reason Subaru redesigned the engine. The new four is slightly more efficient—EPA ratings for our four-speed-automatic test car jump 1 mpg in each test to 21 city and 27 highway—saves weight, and paves the way for the future adoption of direct injection. Dynamically, the Forester is basically unchanged, which means the entry-level SUV/crossover/wagon behaves more like a car than its tall roofline would suggest, with no excessive roll or understeer. Our skidpad was covered in snow, preventing us from measuring lateral acceleration, but we suspect the updated Forester will turn with nearly identical gusto to the 2009 model, which hung on for 0.79 g.
We did, however, note an appreciable improvement in acceleration times. The old, EJ-powered 2.5X dawdled its way to a 9.7-second 0-to-60-mph time and a bury-your-head-in-the-sand 17.4-second quarter-mile. With the FB burning, the 2011 model is a full second quicker to 60 mph and shaves 0.6 second off the quarter-mile, downgrading that gripe to “nothing to brag about” and upgrading the ET to 16.8 seconds. But excellent sightlines, comfortable front seats, and standard four-wheel drive entice buyers into the Forester, so most drivers will never realize their car isn’t quick. A base Forester 2.5X starts at $21,220. Even with the $1200 automatic, the Forester starts roughly $1500 below the cheapest four-wheel-drive Honda or Toyota, and it is more than $5000 less than the cheapest four-wheelin’ Tiguan. The top-rate Touring trim like that tested here is more dear, requiring another $6300. It adds HID headlights, a panoramic sunroof, leather seats, an upgraded stereo, and various other trim bits. The Forester 2.5 XT Premium AWD was designated “Best in Class” for Small Crossovers. The Outback 2.5i LTD AWD won “Best in Class” and “Best Resale” in the Wagons category. The Impreza WRX AWD four-door was named “Best Resale” in the $25,000 to $30,000 category. Kiplinger’s evaluates “Best in Class” winners on performance, value and safety. “Best Resale” winners were selected using the Kelley Blue Book’s estimated trade-in price. Kiplinger’s notes that the Forester — also recognized by the publication in 2009 as the “Best New Crossover” — boasts “agile handling, high resale values, [and] loads of cargo space.” The Forester, like all other Subaru models, is also a 2011 IIHS Top Safety Pick. Subaru of America, Inc. today announced continued record-breaking sales for February, up almost 20% compared to the previous year. February sales records were set by Forester, Impreza, Legacy and Outback. Impreza WRX volume more than doubled compared to the prior year and helped lead the Impreza carline to an impressive 40% increase. “This is by far the best start to a year we’ve ever had,” said Timothy M. Colbeck, senior vice president of sales, Subaru of America, Inc. “We have been working to get more units to our dealers, but every time we think they will build some inventory, they increase sales instead. With the exception of the Cash for Clunkers comparison in August, this is our 12th consecutive record month.